If it ain't broke, make it better. In previous posts, I showed you how to create a report using Visual Studio 2010 and how to add a hyperlink to the report. In this post, I show you how to add an expression based image to each row of the report. This is similar to displaying a checkbox column for Boolean values. A sample project is attached to the bottom of this post. To start off, download the project we created earlier from here. The report we created had a “Discontinued” column of type Boolean. We are going to change it to display an “available” icon or “unavailable” icon based on the “Discontinued” row value. This post shows you how to host a Silverlight application in the Google App Engine (GAE) platform. You deploy and host your Silverlight application on Google’s infrastructure by creating a configuration file and uploading it along with your application files. In the previous post, you saw how to create an OData feed and pre-filter the data. In this post, we will see how to shape the data. A sample project is attached at the bottom of this post. The Product feed we created earlier returns too much information about our products. This post shows you how to add a hyperlink to your RDLC report. In a previous post, I showed you how to create an RDLC report. We have been given the requirement to the report we created earlier, the Northwind Product report, to add a column that will contain hyperlinks which are unique per row. The URLs will be RESTful with the ProductID at the end. Clicking on the URL will take them to a website like so: http://localhost/products/3 where 3 is the primary key of the product row clicked on. To start off, open the RDLC and add a new column to the product table. You see differences in the way IE renders your web application locally on the ASP.NET Development server compared to your production server. Comparing the response from both servers including response headers and CSS show no difference. The issue may occur because of a setting in IE. 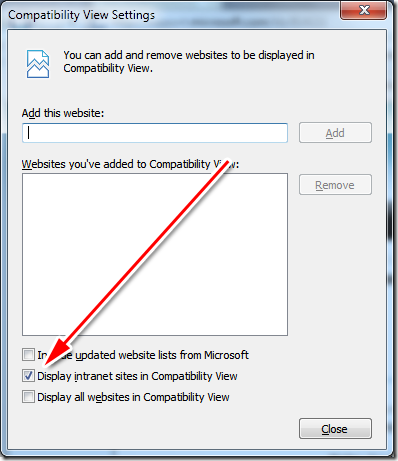 In IE, go to Tools –> Compatibility ViewSettings.